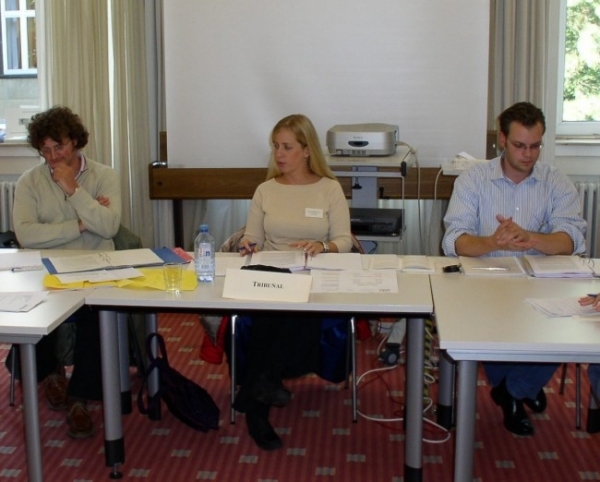 From August 31 to September 4, 2003 CENTRAL in cooperation with the German Institution of Arbitration (DIS) organized the first Cologne Summer Academy on International Commercial Arbitration. 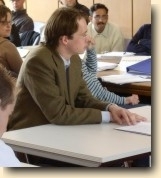 The Academy was hosted by the University of Cologne. 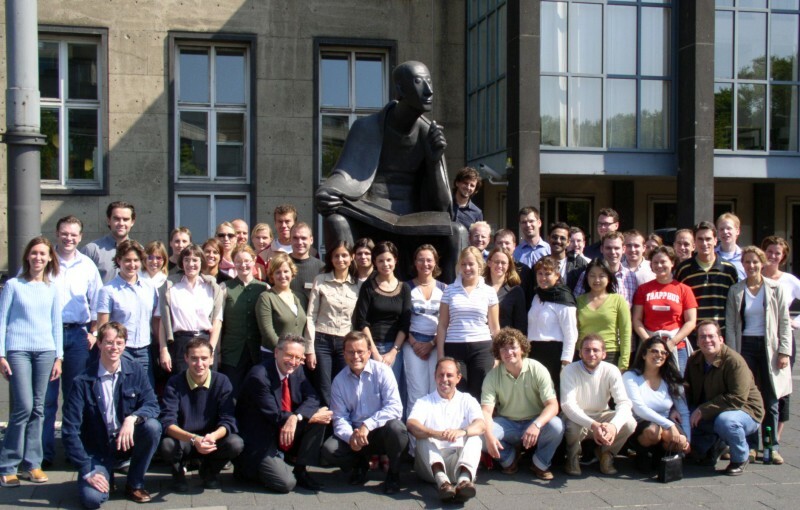 Forty-six students and young practitioners from twelve countries attended the event. Unlike others, the Academy was based on an interactive teaching concept. 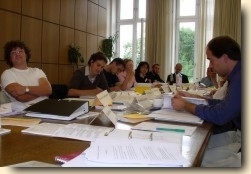 Four weeks prior to the Academy, the participants had received a case scenario concerning a dispute between a Dutch importing company and a Swiss Exporter. 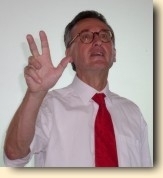 The dispute involved the non-delivery of long distance measuring instruments which was caused by the bankruptcy of the Swiss exporter"s South Korean supplier during the South East Asian crisis in 1997. At the outset of the Academy, participants were split into two groups, "representing" the claimant and the respondent, respectively. A three-member arbitral tribunal was also appointed from among the participants. Lively debates evolved between "counsel" and "arbitrators" concerning the legal issues and facts of the case scenario. The scenario was taken from the book "Arbitration Interactive", an interactive casebook which combines Book, DVDRom and internet-homepage (www.private-dispute-resolution.net). Issues related to the constitution of the arbitral tribunal, to conflict of laws and the relationship between party autonomy and proactivity of arbitrators, the role of arbitral institutions, the setting aside and enforcement of arbitral awards were discussed during the Academy. 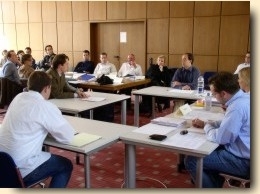 Participants also received the unique opportunity to practice oral pleadings and the examination of witnesses. The differences between examination in chief (of the party"s own witness) and cross-examination (of the other party"s witness) were discussed extensively and practiced by the students. The techniques used were then reviewed by the workshop leaders. Workshop leaders and student then watched and analysed the videos of the arbitration case study from the DVDRom. Particular emphasis was also placed on the psychologies of the arbitral process and the soft skills involved. The students thus got a very realistic picture of the practice of international arbitration. 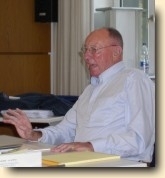 The Academy workshops were conducted by a distinguished faculty: Professor Martin Hunter from Essex Court Chambers, London, Professor Dr. Klaus Peter Berger, University of Cologne, Constantine Partasides, Freshfields, Bruckhaus Deringer, Paris, Stefan Hoffman, Editorial Manager, Arbitration Interactive and Hilmar Raeschke-Kessler, Attorney admitted to the Federal Supreme Court, Karlsruhe, Germany. The Academy"s social program included a guided tour through the beer houses and old city centre of Cologne, where participants had the opportunity to sample different varieties of Kölsch, the local beer, and a boat trip down the beautiful river Rhine. At the end, each participant receive his or her personal copy of the casebook "Arbitration Interactive" including DVDRom and a CENTRAL/DIS-Attendance Certificate.